A major feature of this rip was the chance to get together with two other couples, men with whom we originally became acquainted through my blogging, then all together at Key West one February several years ago. The trip was originally conceived as a celebration of the 50th birthday of Michael Rockwell, who blogs as UrSpo, by his husband, known in the blogosphere as Someone. But there were also a couple of anniversaries among us: Fritz's and my 15th, and Doug Taron (Gossamer Tapestry) and Leon Halloran's 30th (! ), as well as a smattering of other birthdays including mine and a very significant one for Fritz. Doug and Leon have been relatively frequent visitors to us in New Hampshire (Doug will go anywhere he can be guaranteed a major supply of bugs to chase and photograph) and we have an agreement that Michael and Someone will visit us before too much longer. Traveling with them was a huge part of the success of the trip and fortunately, the comfortable dining room of the Wilderness Discoverer conveniently featured booths and tables for six. The boat had all kinds of gear for exploring and enjoying the magnificent, truly untouched landscape, bays and fjords we were visiting. We all kayaked, and Someone tried out a paddle board which can be propelled standing like a gondolier, kneeling, or sitting -- he alternated the first two with aplomb. On this particular day, the big adventure was the Baird Glacier in Thomas Bay. In the skiff that's just about to cast off from the fantail of the big boat are, left to right, Doug, Leon, Fritz and Michael. Safety was a major component of our travel and featured three different styles of life jacket: the big ones in the event of an abandon ship order which we kept in our cabins, similar but lighter models for travel by skiff, seen above, and a compact vest-like model for kayaking. 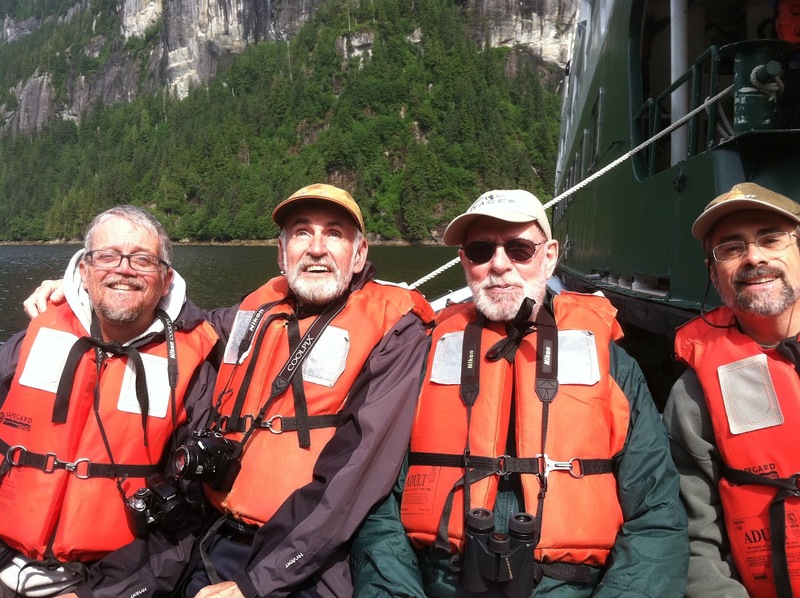 Our guides were all very knowledge about flora, fauna and the way in which Alaska had been (and still is being) sculpted by hundreds of millions of tons of ice and seismic activity over the eons. Leon, who has a great interest in and knowledge of geology, was a frequent resource as well. 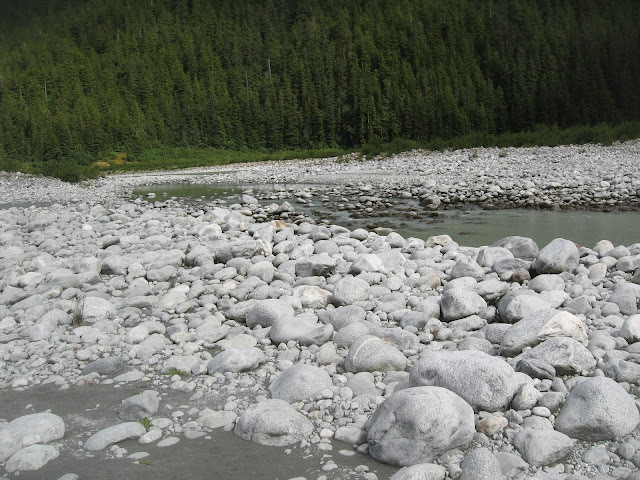 We arrived at this little river and began our trek to the glacier over these rocks, all glacially deposited. 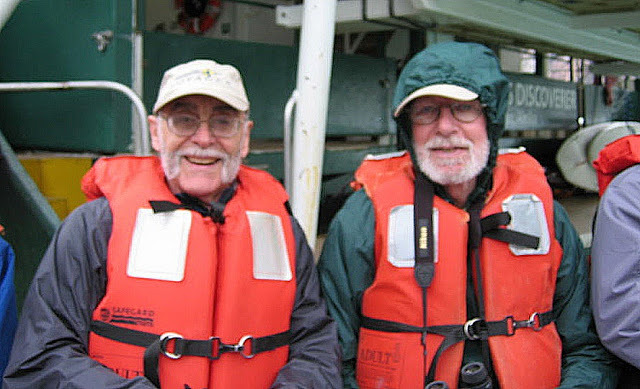 As we left the skiff and waded ashore in our high boots, we heard a noise like thunder behind us and turned to see part of the 700 foot or so cliff behind us sliding down, part of Alaska's cycle of constant weathering and carving of rock. Bare ground was succeeded by a beautifully carpeted area of mosses, lichens, mushrooms and wildflowers, about three inches deep and reputed by the crew to be very comfortable to sleep on. A few baby Sitka Pines were just beginning to sprout. It was lovely landscape and easy to walk. It would soon end. The Baird glacier sprawls out of the Stikine Ice Field and is one of the 95% of Alaskan glaciers that are currently receding. It is still a formidable force, pushing ahead of it and out of its sides tall moraines, ridges of rock, sand and silt. Once the mossy carpet ended, we were in a kind of Moonscape. One of the moraines, a good twelve feet high, seen from the glacier's side. We soon found ourselves on top of the leading edge of the glacier itself. Most of us had taken hiking sticks from the boat and they were an immense help negotiating this section of the hike. What you see is ice, mostly covered with rock but with concealed crevices and holes in it that required caution. Then there is the beginning of what we had been warned was "boot-sucking mud" by the crew. It is very fine glacial silt, rock ground not into sand but to a powder, mixed with rain and the glacier's own slowly melting ice to make a sticky muck that works exactly like quicksand. If a boot got caught, it could not be pulled out by lifting the leg but had to be grasped by its top rim with both hands, preferably while someone else was holding you from falling over. Several of the group got stuck and soon learned to step from rock to rock and keep together for safety. Some of the mud was a reltively thin layer over solid ice and could be walked safely -- but you never knew. The mudfield photographed from the top of one of the moraines, with the vastness of the glacier behind it. It could be the high desert seen from above or the surface of a planet photographed by a space probe, but it is the Baird's deep mud swept into textures and patterns by wind and water. Fritz and I in the skiff back at the Discoverer. Each day's exploration was capped by really good food and wine, a wide variety of cocktails put together skillfully by bartender Shaun, and fine desserts. End of day; moonrise over the fjord. That looks like a wonderful vacation and I didn't even realize that you met the good Doctor and the lovely Someone. I hope one day to take trips like this. But, after the kids are gone though! What beautiful pictures, especially the final one of the moonrise over the fjord. I remember the fjords from our trip to Norway back in the 80s, and we saw a glacier as we crossed the tundra from one side of Norway to the other. But I'm agewise in between you and Fritz, and I could not have done this trip. Very nice! I'm sure that after a day filled with adventure that just about any meal would taste wonderful, but it sounds like you had the added bonus of really good food (and wine!) to cap off the experiences. Sigh! Wow, I read all the blogs, and this was a fantastic trip to be brought along! Breathtaking photos. Wonderful descriptions. And it looks like great travel companions. Belated birthday and anniversary wishes to all. What an amazing adventure! I love the moonrise photo. Well, all the photos actually. But that one especially.